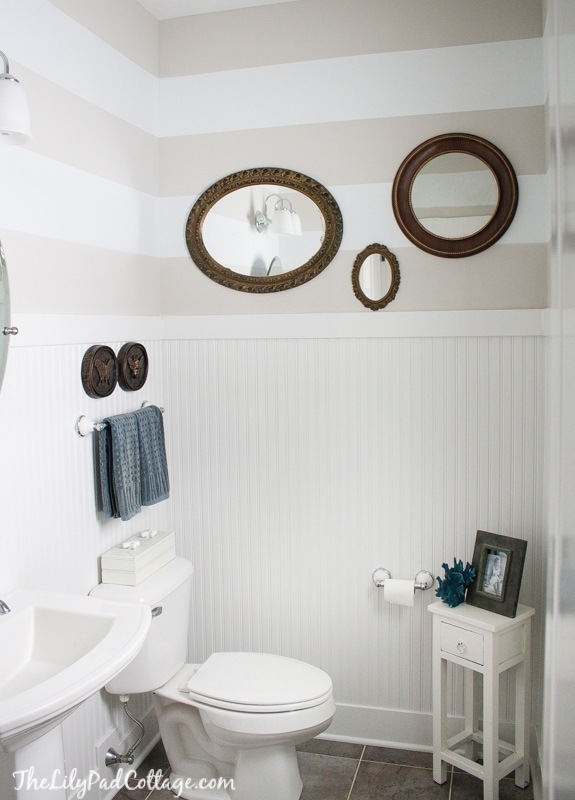 Coastal Bathroom – I love me some stripes! When we first moved in this bathroom was pretty blah, just beige walls. I was 7 months pregnant with little man when we moved in and towards the end of building I sort of lost my will to design. I had clear ideas for a lot of the house when we started and then near the end I was just sick of making 10,000 decisions and also possibly, just maybe, a smidge, the teensiest smidge hormonal (the Mr. might remember it as a little more than a smidge..). I was all “just paint it all beige”, who cares!! So, about 10 months after we moved in, we added the bead board and I painted the stripes on the wall. Loved it! I loved the stripes so much I was on a huge stripey kick and was all “must stripe all the things! !” but then I remembered all the tedious measuring, taping, re-taping, re-measuring nightmare and decided this little dose of stripey-ness was just enough. 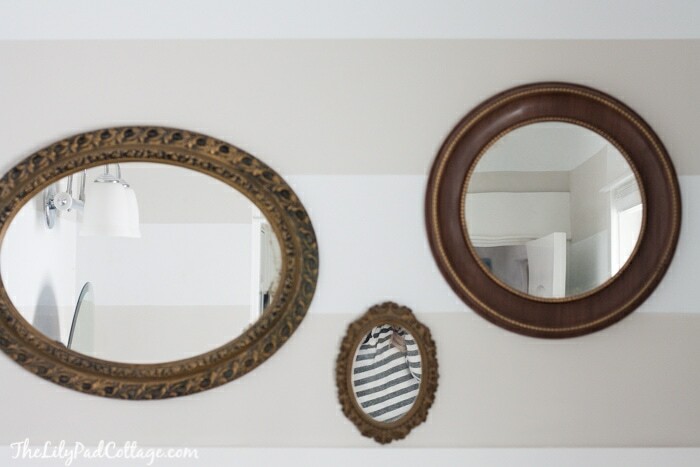 I found these mirrors at a vintage store for $5 each – score! Hello! photobomb (in the middle mirror) by me and my stripey shirt, further proof that I love me some stripes! 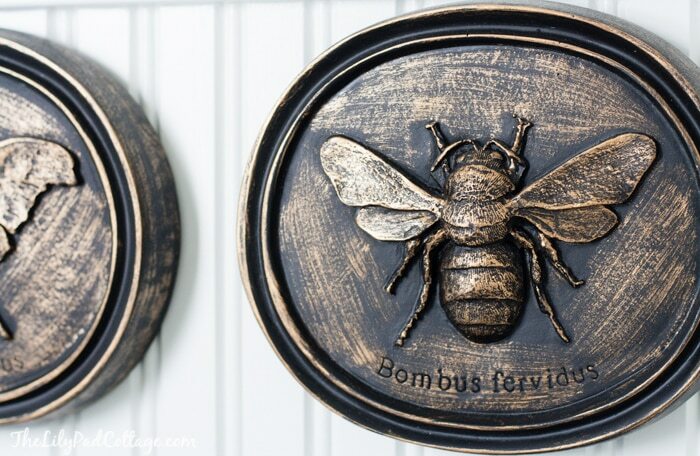 I love these wall plaques from Ballard Design, these were another total lucky score. My mom had ordered them from Ballard for her house and they are actually a set of 3, but one was completely smashed inside the box. Ballard Design was totally awesome and just sent her another set and told her to keep the broken set, so I inherited the 2 that weren’t broken. This bathroom is pretty tiny, it’s on the lake side of the house right off the mudroom so everyone uses it to change into their bathing suits when we have friends out. 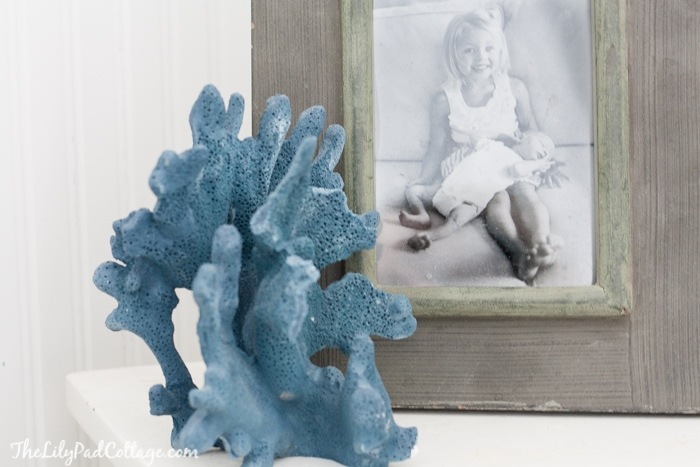 It’s pretty much just big enough to turn around in, so there isn’t a whole lot of room for accessories, but I did add this little table with the coral and the photo for a pop of color. 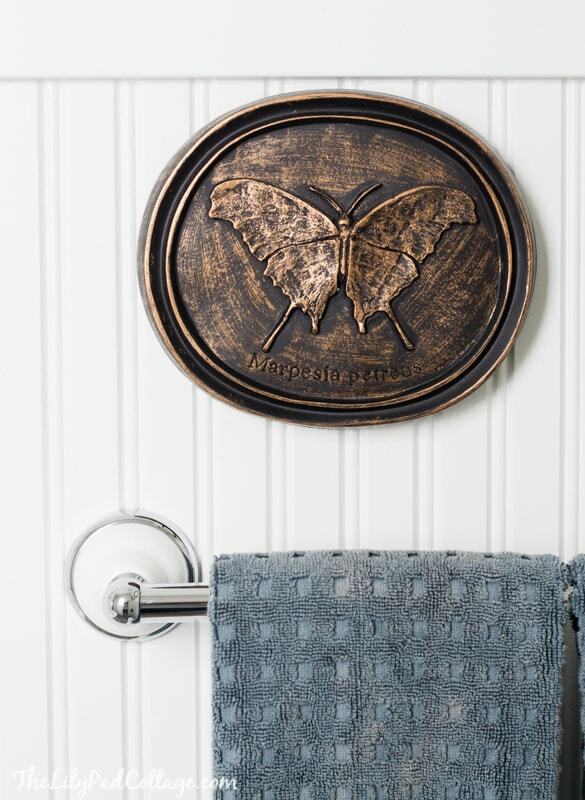 « Vintage Door Decor – opinions needed! Looks great – I love stripes too but don’t have the courage to try it in my home…maybe it’s time! Cute bath. ha. I don’t miss those hormones one bit….either does my hubby. I actually made the worse decorating decisions while I was preg. Love, love. It looks fabulous. I will send you my address. How soon can you be here to stripe me? Great taste. Awesome costal bathroom! Your gorgeous home wants me to move to the beach! 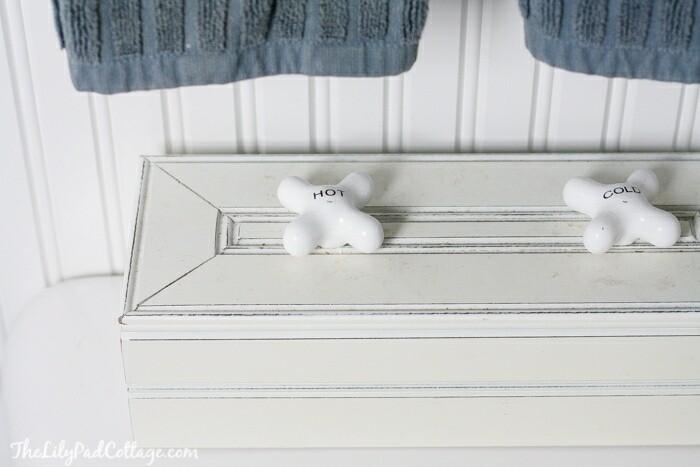 I love the box behind the toilet with the hot and cold knobs…did you make? Is it for TP? Such a beautiful and peaceful bathroom. Love the stripes and the accessories one the walls. It’s perfect Kelly! 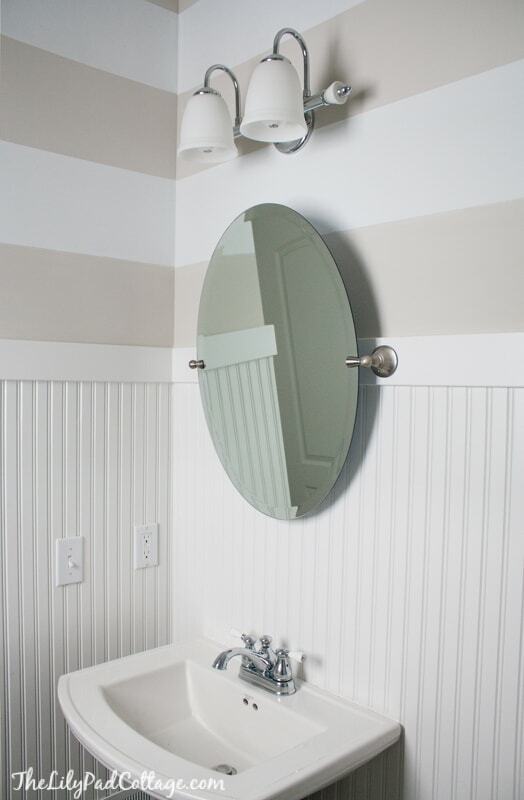 I love beadboard and the stripes are so worth the time and effort to get them done! I’ve striped my dining room twice – the first time it was ever painted and a few years later when it needed a fresh coat of paint. It’s needing it again but I say no more stripes. It’s going to have to be plain and boring now! 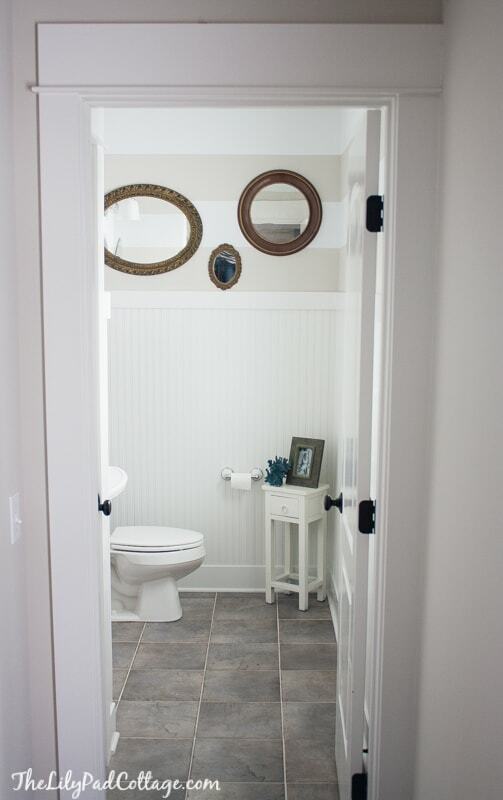 What a cute little room Kelly – thanks for sharing :-) We’re still finishing our powder room which just needs paint now, but it links to the laundry and that needs painting too – always something to be done!!! I hear you I have about 20 projects in the works right now! Did you do a tutorial on the breadboard? It looks fabulous. LOVE the bathroom Kelly! It looks beautiful. Stripes are too much fun. I just ordered a striped chair and I can’t wait to get it here! Oh and your red door is to die for! It’s beautiful on its own but I can picture it with pictures too! You can’t go wrong with that one. Beautiful Kelly!!! Just Pinned! I did stripes in my hallway before the holidays & I LOVE them, there is something so simple & pretty about the cream & beige . Great Job! Thanks friend! Can’t WAIT to see your master bedroom finished! 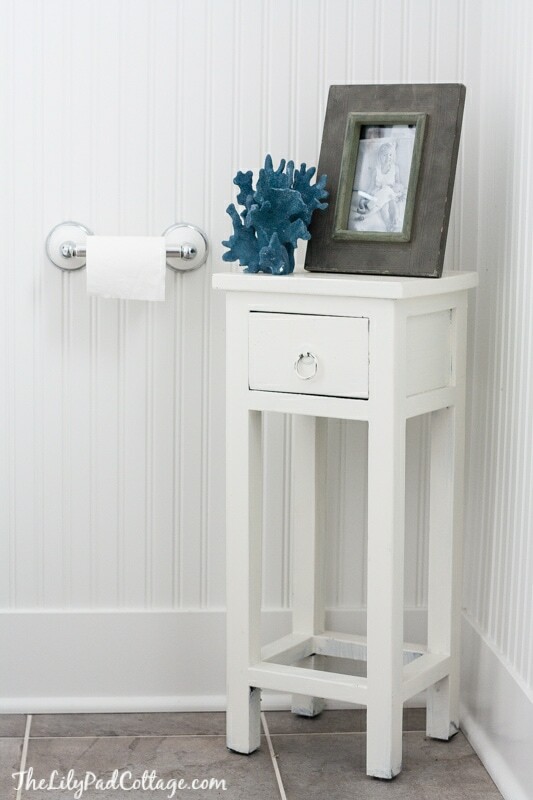 Love your bathroom! Your home is beautiful. Would you mind sharing your tile details? Thanks. Hi Michelle! I looked everywhere and can’t find the info on my tile :( sorry! I so wished I had known I would be blogging back when we built I would have kept every detail for you guys! Love the bathroom. Especially the beadboard. 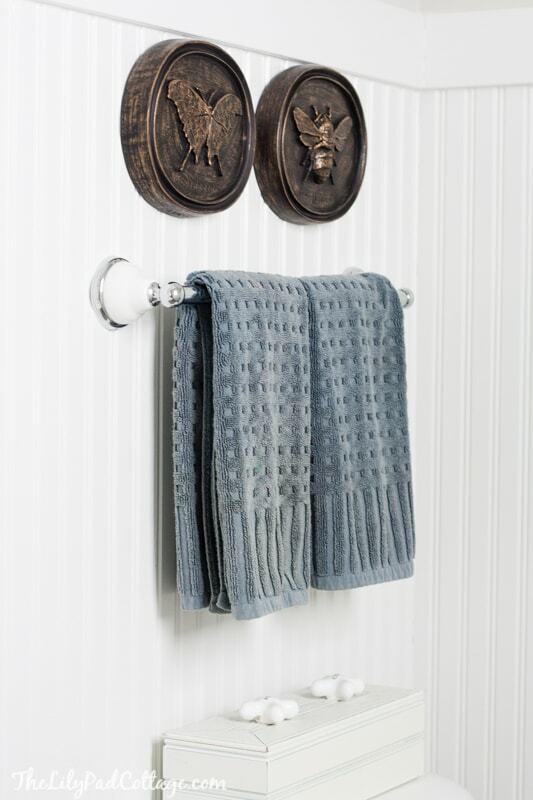 I need some immediate help- What did you use for the trim of your beadboard? I like yours very much – classic and simple. Was it a 1×3 or 1×4??? Carpenter working on beadboard next week. Thanks so much. Hi! So pretty! Can you share the paint colors in the stripes? Oh Man I have no idea this post is from our old home about 6 years ago – sorry!